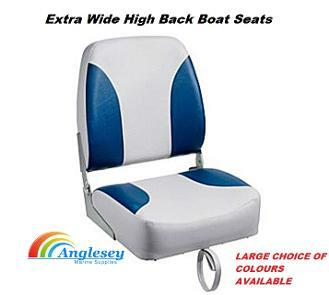 Boat seats in a wide range of choice and colours ideal for speedboats, fishing boats, ribs, yachts from Anglesey Marine Supplies. Helmsmans seats, boat seat pedestals high back boat seats ideal for open fishing boats and dorys. Boat Seat pedestals available in a choice of materials and sizes to fit our boat seats. 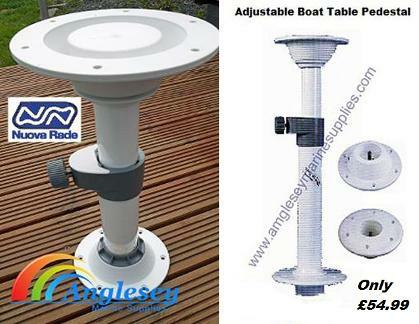 Boat table pedestals also supplied, fully adjustable, also useful for caravans and motorhomes. 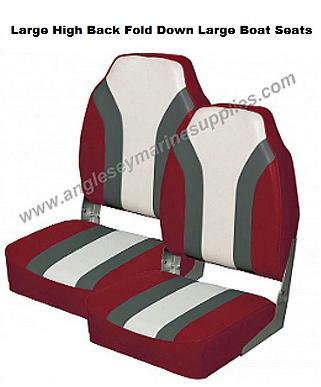 All at reasonable prices, Try Anglesey Marine Supplies For Boat Seats And Tables. Garelick seats and reversible boat seats now in stock. 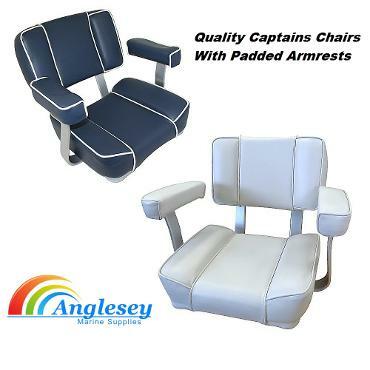 Large high back fold down deluxe Boat seats, Has wider seating for more support. 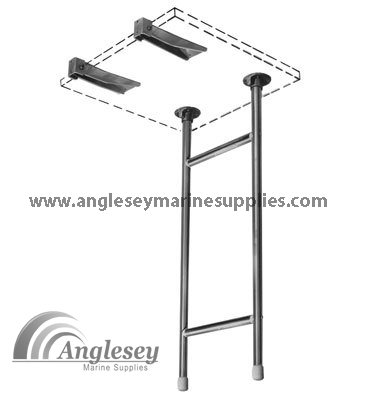 Ideal for Ribs, Speedboats, Fishing Boats. Has the standard 51/4" hole centres for fixing. Seat Height 24", Width 17", Depth 20". Available in White/Grey/Charcoal, White/Red/Charcoal and White/Blue/Charcoal. Please use drop down choice bar for options of boat seats. Premium low back boat seat. The boat seat dimensions are 19" height, 16" width and 14" depth. The boat seats come with the standard 51/4" hole pattern to fit onto pedestals and seat swivels. The low back boat seat comes in colours white, navy blue, grey or blue. Big Man deluxe large boat seats, built to fit the larger boater, as an high impact plastic frame construction, covered in a UV and mildew resistant vinyl. Seat Height is 26" and Width is 21", Depth is 22".Available is Grey/Charcoal or Grey/Blue, Please use drop bar for colour choice of large boat seats. 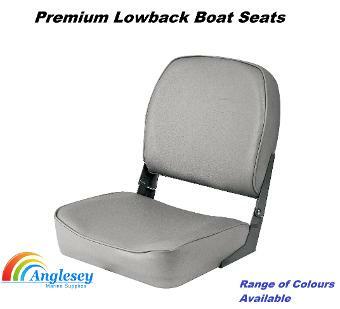 Premium wide folding boat seats with high impact plastic framework for years of rugged dependability, whilst the extra high back provides ample back and shoulder support. Upholstered in high grade marine vinyl. Available in 3 colours, Please use drop bar for colour choice. The boat seats are available in a wide choice of colours. The boat seats dimensions are height 22", width 17" and depth 15", the boat seats are wider than conventional boat seats for more comfort. 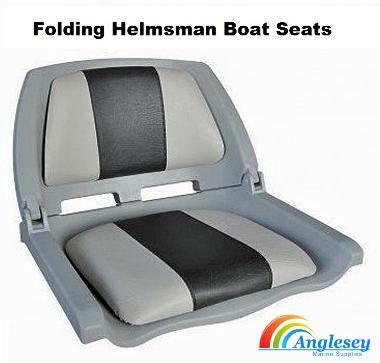 Folding helmsman boat seats, ideal for open fishing boats and dorys. 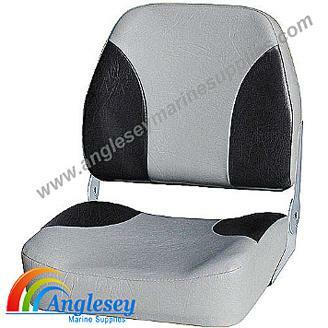 Action helmsman boat seats are durable and over excellent protection against all weathers making it an ideal boat seat. Ideal for fitting onto boat bench seats. Comes in tow colours either blue/white or blue cushion white seat. Quality captains chair boat seats. The captains chair boat seats have padded armrests. The boat seats are built for premium support and all the boat seats components are manufactured from anodised aluminium for excellent corrosion resistance. 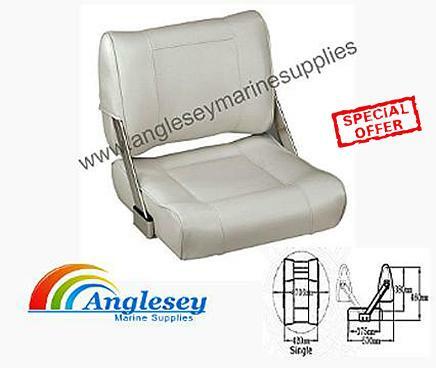 These boat seats give excellent back support and the boat seats material is a durable marine grade vinyl for long life. Two colours are available with this boat seat, white and blue. The captains chair boat seat dimensions are 17" wide, 15" deep and 19" high. 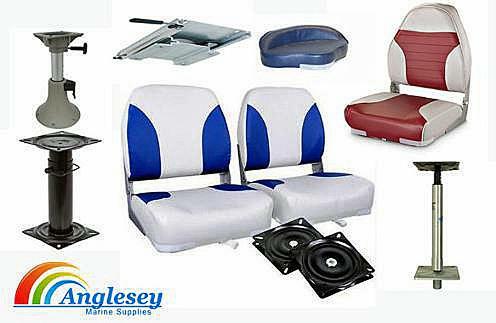 Reversible boat seats with adjustable and reversible back support. Can be reversed to sit facing front or back. Ideal for spotting when water skiing. Manufactured from high impact frames upholstered using marine grade vinyl. All hinges are manufactured using anodised aluminium. Available in either white or navy blue. Dimension are width 17", depth 15", height 18". The reversible boat seats are available in two colours either white or navy blue. 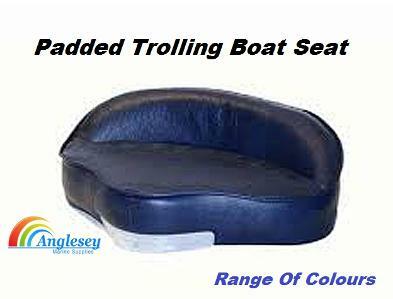 Padded fishing trolling boat seat. The boat seat base is fitted with “T” nut inserts for quick attachment to swivel or pedestal. Colours available Blue, Navy blue , grey, dark green and charcoal. Please also look on this page at our range of pedestals and swivelsto fit this trolling boat seat. Nuova Rade removable and adjustable boat table pedestal, made from alloy and durable plastic, The boat table pedestal base is 235mm, Adjusts from 370mm to 600mm. 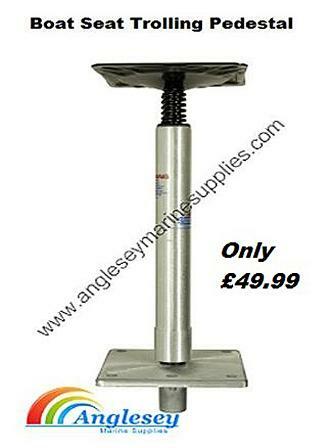 The removable boat table pedestal is ideal for boats, motorhomes and caravans. The boat table pedestal as 2 options of mounts either surface base mount as shown or a flush mount. 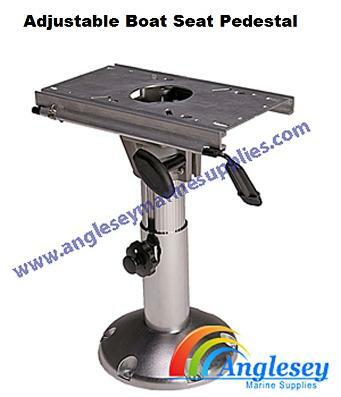 The boat table pedestal is removable easy by unscrewing from the base. 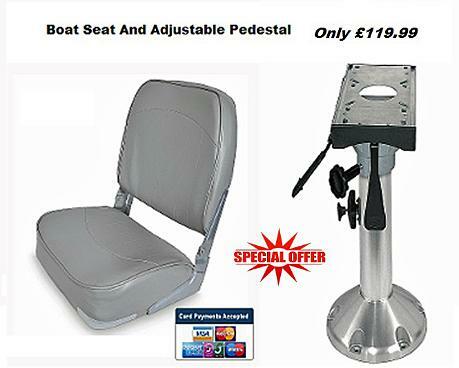 Adjustable boat seat pedestal with positive locking swivel and 5 different types of heights available. Please note slider sold seperately below. 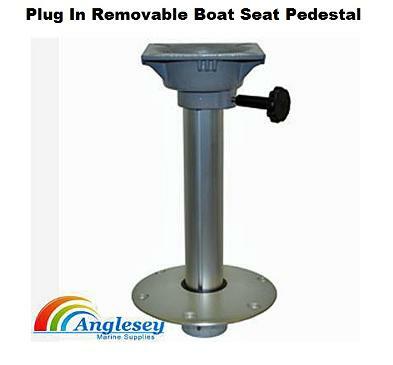 Plug in boat seat pedestal with swivel, ideal as boat seat pedestal can be removed to save space when not in use. Flush fitting design manufactured from anodized aluminium. Also ideal for caravans and motorhomes. 380mm in height. Stainless steel boat seat pedestal. 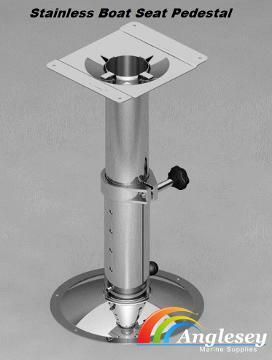 The stainless steel adjustable boat seat pedestal adjusts from 540mm to 720mm, manufactured from highly polished 316 marine grade stainless steel. The stainless steel boat seat pedestal comes with a swivel top and accepts all standard boat seats. 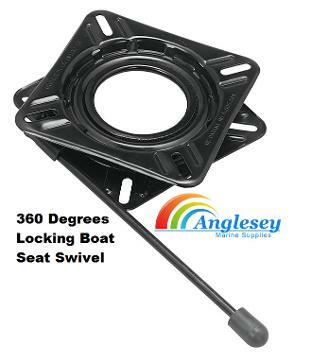 360 degree boat seat swivel, has a locking mechanism to enable seat to be locked in 4 positions. Zinc plated. 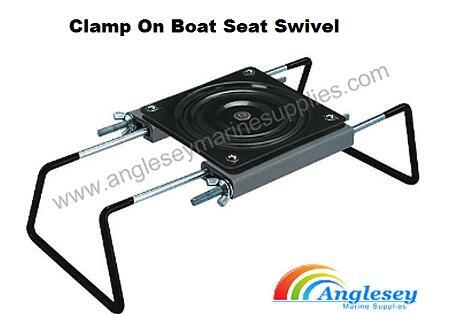 Clamp on boat seat swivel. Adjusts from 8” - 18”. Swivels 360 degrees with self-lubricated poly bearings. Made from powder coated steel to resist corrosion. Used for mounting boat seats to existing boat benches without drilling. 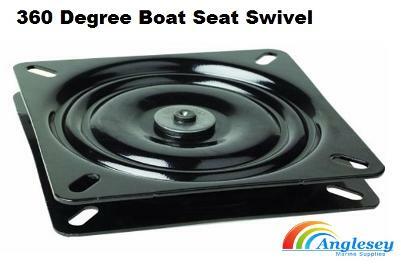 360 degree boat seat swivel. Heavily powder coated to resist corrosion. Will fit all boat seats and pedestals. 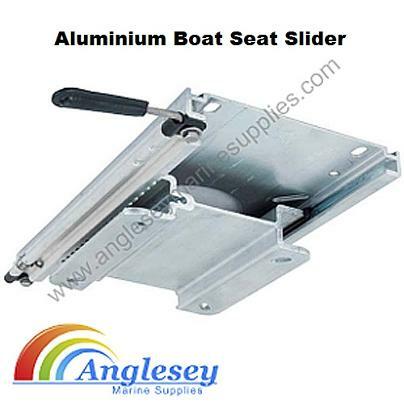 Adjustable Boat seat slider, can fit standard seat swivel or seat direct to surface. Then allows boat seat to adjust backwards and forwards by means of lever at front. 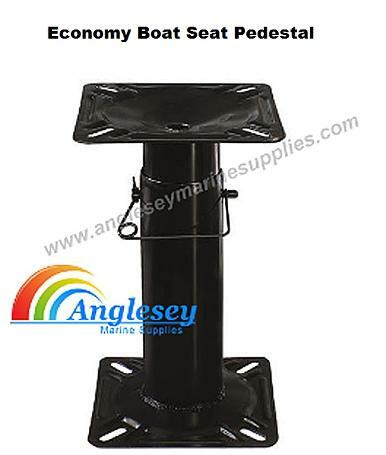 Economy boat seat pedestal, made from steel construction and finished in a EDC black powder coating. Adjusts in height from 12" to 18". Predrilled to accept all standard boat seating. Garelick side mount helmsman boat seat support, made from aluminium. Uses sockets on seat and deck to remove H section legs when seat is not in use. The seat is attached to the gunnel by 2 hinged brackets which when legs are removed lower to side of boat. Seat not included. 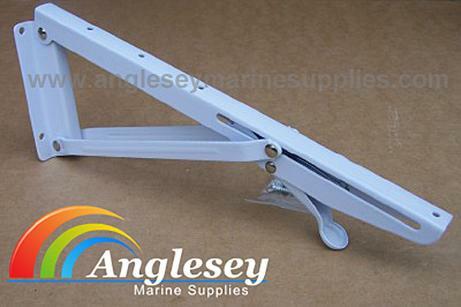 Adjustable folding boat shelf bracket, made from stainless steel. Side mount is 6.5” ( 165mm) high by 12” ( 310mm) long. Manufactured using 1” thick channel. Folds flat when not in use. Ideal for temporary boat shelves and tables were space is limited.